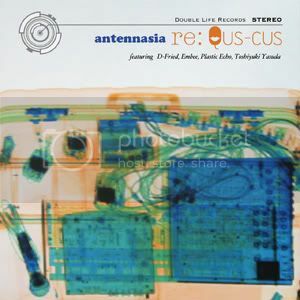 When the Sendai, Japan based duo antennasia released their most recent studio album 'Qus-cus' in 2010, I described it as the summum of their previous works. On their earlier albums you could feel producer nerve looking for a definite angle, to find the perfect sound to accompany the already perfect voice of vocalist san. The tracks were there, but the wheels just didn't quite fit perfectly on the rails. Good as all those songs were, they never hit the level of perfection nerve was finally able to achieve on 'Qus-cus'. Two years on four remixers got the task to take all that perfection and, let's say, redo some of the architecture design. Not a task for amateurs and because of the high expectations, antennasia focussed on quality rather then quantity. Four of the strongest tracks from the original album were selected to form the whole that is 'Re: Qus-cus', warped and shaped by four internationally recognized producers. These four producers were of course very lucky to have a solid base to work with, in the form of the ever so lovely vocals of san. Come to think of it, one could put the sound of construction work or even the agonizing sound of 500 fingernails scratching a blackboard simultaneously, underneath her vocals and it would still be the most beautiful thing you have ever heard. In turn, it's lucky for us, the listeners, that these producers have put a little bit more effort into it. 'Re: Qus-cus' opens with an amazing rendition of 'Passion Show' by Toshiyuki Yasuda, former member of Fantastic Plastic Machine. The track oozes with freshness, even though it feels like you're walking in a familiar neighborhood. Yasuda's happy go lucky approach brings out the sun and chases the clouds over the horizon. The daylight only lasts a short 6 minutes though, as Swedish Looptroop Rocker Embee brings in the stale summer night with his vision of 'Metronome Wiper'. Harmonic pads and cut-and-paste piano's are served with tranquil beats and snaps, with the soothing vocals of san acting as glue. Things get kinda gritty when D-Fried takes us deeper into that night and reintroduces us to the lovely features of the 'Gynoid'. She's changed from when we last saw her two years ago. Edgy, but elegant. Apparently, hanging out with a Barcelonian master of gloom will do that to you. We head back to Tokyo with the Plastic Echo remix of 'noanoa', where soundscapes are ingeniously stitched and patched into a complex mesh of different sonic flavours. Towards the end you wonder whether you'll ever see daylight again, but it's a perfect finale to a fascinating showcase of four of most talented producers of this time. All in all, you'd wish 'Re: Qus-cus' lasted a little longer, but as a 4-track EP, it certainly stands its ground. None of the tracks are enhancements over the originals, but they simply offer a different point of view. And it is a very pretty view. But if you really want more, do yourself a favour and also get the original 'Qus-cus', as it really is an essential addition to your collection. 'Re: Qus-cus' is available on iTunes and various other digital music stores from July 25th. This page contains a single entry by Peter Zoon published on July 22, 2012 9:08 PM. Battlefield 3: Armored Kill Trailer was the previous entry in this blog. The Helio Sequence - Hall of Mirrors is the next entry in this blog.